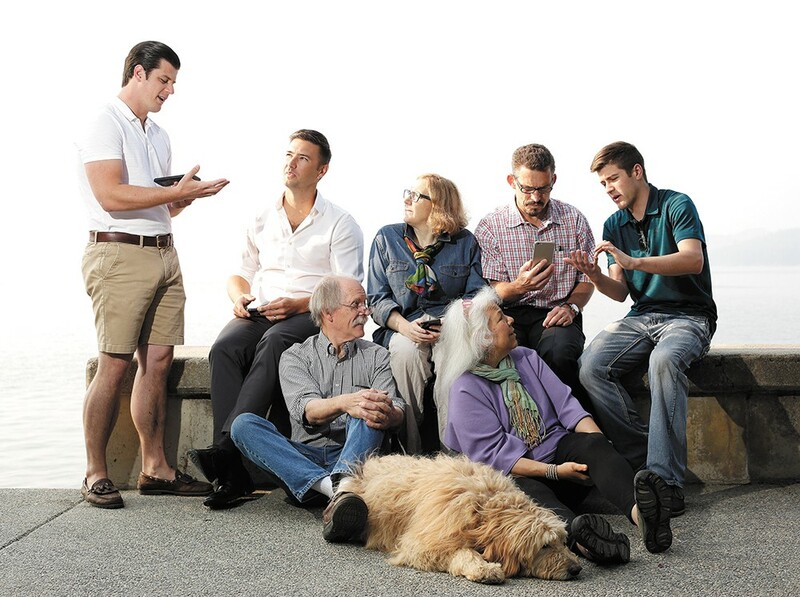 Front: Gizmo CDA founders Marty and Barbara Mueller and their dog, Hobbs; back (from left) Lamplight Heritage owner Tyler Lowe, NIC's Ryan Arnold, Art Spirit Gallery's Blair Williams, UI's Charles Buck and VR CDA owner Colton Hoffman. In some ways, Coeur d'Alene is like other Northwest locales transitioning from an economy focused on utilizing natural resources to recreational enjoyment of them. Spokane's recent slogan was "Near Nature, Near Perfect," Sandpoint advertises "It Just Comes Naturally," and Coeur d'Alene bills itself as "Your Lakeside Playground." Of course, recreation isn't the only focus; all three areas are exploring emerging industries, especially technology, as a focus of their economic futures. In the Lake City, both recreation and technology are integrated into the city's vision for the future, which foresees a vibrant downtown that continues to be both a recreational destination and an economic powerhouse. Innovation Collective, for example, is a downtown collaborative hub housed in the renovated former Elk's Lodge. It offers workspace, programs designed to facilitate cross-industry pollination and events highlighting the potential of technology, such as the upcoming fourth annual Think Big Festival Aug. 24-25. Innovation Collective's festival coalesces around a cross-section of industries featuring nationally known speakers representing robotics, health care, retail, media arts, entrepreneurialism and emerging technologies, as well as local groups like xCraft, a drone maker that relocated to downtown Coeur d'Alene in 2016. "Much of our work is focused on being a connector to many people who are looking to pursue their dreams," explains Innovation Collective's Chief Operating Officer Chris Cochran, who loves fishing, is an avid outdoor runner and recently got into cycling. Innovation Collective is one of many businesses connected to CDA 2030, a nonprofit formed to help guide Coeur d'Alene's future with input from civic groups, government, businesses, education and the public. University of Idaho professor Charles Buck led data collection efforts and appreciates how CDA 2030 focused on areas of agreement versus potentially divisive issues. "It's a framework for progress," says Buck, who enjoys skiing and boating in his spare time. Three-thousand community members were surveyed, helping shape CDA 2030's implementation plan of strategies and actions in six key areas: community/identity, education/learning, environment/recreation, growth/development, health/safety and jobs/economy. Over half the respondents, for example, said Coeur d'Alene's greatest strength is its scenic beauty and environment, while a weakness is lack of jobs combined with population growth. So while increasing lake access, preserving water quality and continuing to improve and expand the trail system are all CDA 2030 priorities, so is maintaining a vibrant downtown and promoting jobs, such as through recruiting living-wage employers and matching workforce needs and educational goals. Technology plays a significant role in several CDA 2030 actions, especially in education, where initiatives include developing high-tech industry awareness, education and training, and promoting robotics and engineering. UI is working with Innovation Collective, for example, to offer free classes based on Apple's Everyone Can Code curriculum in a statewide effort they're calling Inspire Idaho. Another tech-centric action item involves creating opportunities for lifelong learners, especially through makerspaces like Gizmo-Cda, which Barbara Pleason Mueller and her husband Marty created in 2014, with support from UI. "The idea of a makerspace is you meet people where they are," says Mueller, an artist and entrepreneur. Tech isn't just robots or a medical device, says Mueller. "When you're going to a Broadway show, technology is all around you." Prior to Gizmo-Cda, the Muellers built and ran MSM Design, which developed high-resolution stereoscopic camera technology used in producing IMAX's Space Station 3D and National Geographic's Sea Monsters. "The difference between what we did [then] and what tech is now is the cost of technology," Mueller says. Technology cost has decreased and access to it increased. And yet, she says, the workforce is still not there. That's a priority for UI, too, says Buck. Its computer science program, for example, offers bachelor's, master's and doctoral levels of learning and six-month paid internships connecting students with potential employers. And, by collaborating with Innovation Collective and North Idaho College, UI can offer a Coeur d'Alene-based four-year computer science degree, which also supports several CDA 2030 educational initiatives. UI, Gizmo, Innovation Collective and NIC are also involved in projects designed to "encourage entrepreneurialism, innovation and business startups as part of larger industry sector/cluster strategies." Recently relocated to NIC, Gizmo, along with NIC and UI, is exploring a Proof-of-Concept Center — an incubator and support system to facilitate and accelerate innovations — and Rapid Prototype Lab with an entrepreneurship-focused, experiential learning program, according to Ryan Arnold, NIC's new director of regional entrepreneurial strategy. It's also looking at developing an Emerging Media Arts Lab focused on virtual reality, augmented reality and digital storytelling, which dovetails with a new downtown startup called Virtual Reality CDA. Developed and owned by Colton Hoffman, VR CDA is yet another collaborator in the emerging tech economy downtown, yet its focus is unique, says Tyler Lowe, who has been working with VR CDA and the Art Spirit Gallery as well as local artists to use 3D scanning to facilitate displays in a virtual environment. "We are at the cusp of a new technological renaissance where the arts and humanities will be flourishing in communities and cultures, this time fueled with new tools provided by emerging tech," says Lowe, whose background includes studies in historical theology and ancient cultures. "As jobs and identities shift from being consumed by industrial thinking to more contemporary themes, humans are turning toward artistic expression as means of not only recreation, but as hopeful careers." Lowe is an unabashed supporter of the arts, which might seem unusual to include in discussions about technology, yet in Coeur d'Alene, it's par for the course. "I don't think it's a question of 'rec to tech,'" says Blair Williams, owner of the Art Spirit Gallery. "It's really 'rec with tech.'" The gallery's collaborations include the Innovation Collective (they're co-hosting a tech party during Think Big Festival), NIC (with whom they put on Creative Conversations with young professionals) and UI (with whom they developed the Arts Ed Co-Lab to teach the business of art). A lifelong resident of Coeur d'Alene, Williams sees recreational opportunities as a draw for many people. They work on a project, go hike Tubbs Hill, then return to their desk refreshed, she says. EDITOR'S NOTE: The online version of this story has been updated to more accurately reflect ownership of VR CDA. The original print version of this article was headlined "From Rec to Tech"